At New World Digital, we pride ourselves on always striving to identify new ways for clients to grow their business online. In this case, the client happened to be ourselves! We have a number of years of experience of digital marketing in the field of plastic and cosmetic surgery, and knew that Plastic Surgeons Marketing was a strong market online, particularly in international markets such as the USA and Australia. 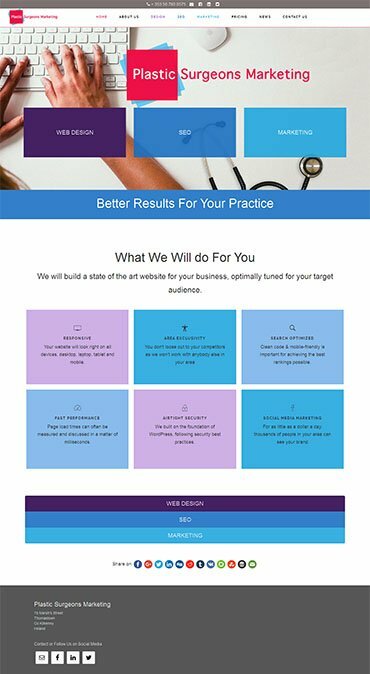 We determined to focus further on the field as part of our continued expansion, by building a dedicated website to offer our website design, SEO, and digital marketing services to plastic and cosmetic surgeons worldwide, and then using our expert SEO skills to get it ranked highly in all key markets. The joint aims were to increase our international client base, and also to illustrate our expertise in developing new online opportunities – because whatever we do for ourselves, we can do for other clients too. Diligent market research and competitor research was the first major key to this project. We identified the key search terms in major marketplaces and the average number of searches for them per month. We then performed competitor analysis to see how other agencies working in the sector portrayed themselves for those terms – and we determined to do better ourselves. Area exclusivity – as we undertake to work with only one client in each city or metropolitan area. We simply can’t get two or more plastic surgery practices to rank number one simultaneously in their local Google listings! No large upfront fee for initial website design or takeover – everything is included in our flat rate monthly fee. We then prepared a detailed map for the site, before progressing to the build itself. Our senior copywriter produced concise yet engaging and keyword-optimised content for the site, aimed at people searching for Plastic Surgeons Marketing, with each page culminating in a strong call to action. Meanwhile, a member of our development team got to work on designing a framework for the site, opting for a clinical design to reflect the clinical nature of plastic surgery practices. Straight lines, strong colours, and strategic marketing funnels lead the user through all key areas of the site. Our developer also performed several SEO techniques as the site was being built. Two other specialists then became involved in further search engine optimisation as the site neared completion, and in the early days after going live. Their work helped see the site already rank on Page 1 for several key search terms on both Google Australia and Google USA in just its first week. Our strategy is now to continue to our SEO and content marketing work, with the aim of soon achieving even higher rankings for even more terms. And ultimately, we hope to have more clients from the international plastic surgery sector in the near future.